I'm so sorry I disappeared for a few days. I won't go into details (this blog isn't about that) but it's been a really crazy weekend, thankfully everything is starting to look a lot better, so I'm going to get back into the swing of things! Two weeks ago I reviewed the limited edition lemon version of these Peeps, which were delicious, and now my expectations for these lime ones are pretty high. Let's hope it delivers. The packing for all three Target exclusive flavors have been the same, so there's nothing for me to discuss design-wise. All three flavors were citrus fruits, so the packaging is literally identical with different color schemes, and a different fruit image. It's appealing, functional, and from a production standpoint, super easy. Inside the plastic pouch are three little marshmallow Peeps in a plastic tray. The chicks are a pistachio-color with some green edible glitter-like flecks, similar to the ones used on the Alex's Lemonade and Party Cake flavored Peeps. Plus, we have that green lime flavored "fudge" bottom. (Come on now, is this really fudge? It seems like flavored candy melts to me.) They look really cute, even though the eyes are still a bit hit-or-miss, and they smell sweet and tangy, like a slice of key lime pie. As a kid, maybe 8 or 9 years old, I ate an entire key lime pie by myself. (A fact I am rather proud of.) My grandmother thought I would hate it, due to the tangy lime flavoring, and gave me a slice as a joke. It backfired. I loved it so much I ate the entire thing, and the aroma from these Peeps bring me right back to that memory. I really really hope these taste as good as they smell. 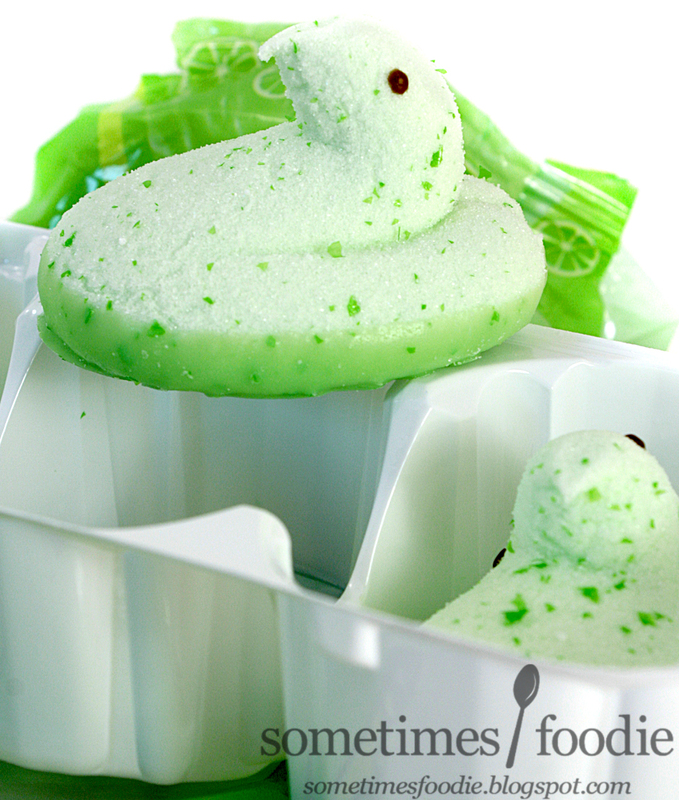 I scooped up a Peep, took a bite, and it was everything I wanted it to be. I am so happy. 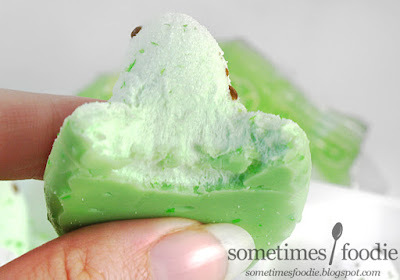 The marshmallow alone has a light lime flavoring, with a hint of citric acid in the sanding sugar outside, while that coating on the bottom is sweet and creamy with a hint of lime zest. When combined, it's like a perfect little marshmallow- version of a key lime pie, complete with meringue, and I love everything about it.